- Janet was born to an American father and an Asian-American mother in Dusseldorf, Germany. A 'military brat', she lived in Germany until graduating high school. - Janet underwent genetic mutation at 14. After much trial and error, her parents assisted her in learning how to hide her mutant abilities, as well as side-effect habits of her strange physiology, such as occasionally eating insets and hiding in larval nests. - Janet returned to America to study science at NYU. She became roommates with Betty Ross, and began to date another student in her science curriculum: Henry "Hank" Pym. Henry was abusive from early on. Janet has been punched, slapped, had her head put through a door, and Christmas was once ruined by being punched so hard that the roof of her mouth was split apart. Betty, supportive, tried to coax Janet to leave Hank, but the two eventually married. - Hank Pym, both Yellowjacket (Giant-size) and Ant-Man, knew of Janet's status as a mutant. Promising to go on medication and end the abuse, Janet suggested a fresh: Joining the Ultimates, a super-team created by the President as a line of defense against foreign super-villains. - After Hank was humiliated in a battle with the Hulk, and learning of a growing friendship between Janet and Captain America, Janet and Hank fought with their superhuman powers. Hank won by eventually using his Ant-Man abilities to overpower Janet and send her into shock by dozens of ant stings. Hospitalized, Captain America attacked Hank, and beat her husband savagely. Shortly thereafter, Hank and Janet's divorce was finalized. - Janet and Captain American began to date, but Janet became bored and rekindled her relationship, in secret, with Hank. She was also elected social media liaison of the Ultimates, which heightened her to celebrity status. 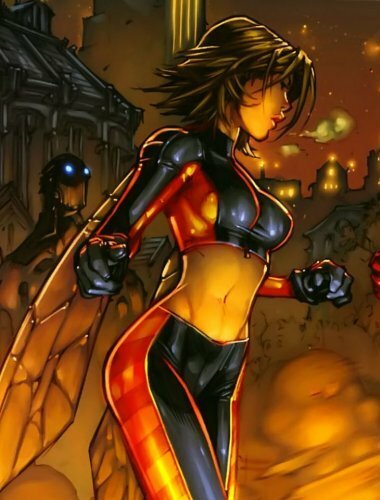 - Wasp was present during the death of Wanda Maximoff, and while she was current team leader of the Ultimates, during the Flood of New York, she was abducted by surviving Liberator agents and placed into stasis against her will. During Secret Wars, attempts to destroy Earth 616 included a ship carrying her stasis tube were caught in the crush of dimensions, and when Secret Wars was done, her stasis unit was opened by S.H.I.E.L.D., and has resumed her prior life, albeit in a different, better place. Janet is a survivor of domestic abuse, but is also guilty of staying with, marrying, and returing to the man who abused her. Her self-esteem wavers with these facts, for in many ways, she allowed herself to be continually abused. That she eventually divorced her abuser hasn't saved her from damaged feelings of self worth and the wounds of loving a man who put her in the hospital. Janet is a mutant, which is something she has kept secret by explaining in graphic detail viable biological changes performed on herself via science. She has not "come out" as a member of the mutant community, and seeing the treatment of mutants in today's society, she fears being discovered. Janet's genetic code has some insect traits that cannot be explained, such as why she sometimes enjoys eating other insects, or sometimes sleeps in her tiny form in a tiny nest made of chewed and regurgitated pulp. This, she also hides from many people. She doesn't do it often, but sometimes, the urge comes and she finds it soothing. Perhaps it's her history of being abused, but Wasp is personable, open, and friendly. She tries to be a crowd pleaser on an emotional level with her compatriots, and seeks to be supportive as much as possible, despite the occasional ribbing and wise-cracking. She's hidden her dark secrets behind a mask of friendliness and sorority sister-like support. Janet is now in a world that doesn't work quite the way that she remembers, and familiar faces are faces she's having to learn again. She has a chance at a NEW LIFE, without the abusive ex-husband and a fresh start with the Avengers. She has a new life available to her, and she's going to make the best of it for herself. That's what the books about surviving abuse say, right? Pick up the pieces and build. Janet's goals are simple: Build a new life that is something she is pleased with, return to the superheroing life that she's familiar with, and if, at all possible, return to the talk show circuit and social media. She really does miss being in the public limelight and having makeup applied before showing up on a late night talk show. Wasp can shrink from her normal size to no smaller than an inch in height, and can maintain her shrunken size, at will, at any size between full height and one inch. She retains her normal human strength, even when in her smaller form, thus a punch from a Wasp who is an inch in size will hurt just as much as a full, closed-fisted punch from a 5'4" Wasp. When shrunken, she becomes a smaller target, thus more difficult to hurt, but can fit through small spaces for infiltration purposes. While shrunken, and only while shrunken smaller than her normal form, a pair of insectoid wings sprout naturally from Wasp's back. Her top flight speed is 60 miles per hour, and her ability to fly can be naturally hindered by opposing forces (wind) and damage to the wings she relies upon for flight. Wasp can produce blasts of bio-electrical energy from her hands. She refers to these as "Wasp Stings". The strength of the sting is made variable by her size. At full height, her blasts are potentially deadly, shocking the human body with the strength of a lightning bolt strike. While in smaller forms, her stings are painful, neurologically shocking stings that can be strong enough to harm even superhumanly durable beings. Wasp is physically in the best shape of her life, though not superhuman. She is toned and muscular, and can endure long periods of cardio-vascular exercise without issue. She is also trained in hand to hand combat, though by no means an expert, is as capable in a fist fight as any given Law Enforcement agent, and knows a variety of strikes and holds. Wasp has a double P.H.D. in Molecular Biology and Biochemistry. With this comes not only a working knowledge of Biological sciences, but the ability to use, maintain, and upkeep scientific biological research in a lab. Wasp has definite Public Relations experience, which includes how not to blanch on-camera when revealing questions are asked, and how to wine and dine an audience when speaking publicly. She knows her way around an interview, and how to hide her stress while speaking in front of large audiences. Wasp has learned how to use her wings for flight, which also includes familiarity with how to navigate air currents, 'dogfighting' maneuvers while fighting in the air, and how to 'thread the needle' when performing flight acrobatics with natural wings. Wasp is a certified 'Doctor'. The amount of time spent studying and researching to earn this degree has given her many methods to research and investigate biological-related issues. Molecular Biology focuses on the function of molecules within the body, such as proteins and acids, and Biochemistry is the study of the chemical processes that take place within the body, such as abnormal brain chemistry, and in some cases, mutation. Wasp has learned to fight as much as any given Federal Agent. This means she knows a varity of holds, strikes, and parries required to subdue an opponent, but the fighting knowledge is beneath the grade of Eastern martial arts, and closer to a mix of Krav Maga, Judo, and Aikido. Due to growing up in Germany, Janet is fluent in both English and German. Janet is secretly a mutant on Earth 616, unlike the Janet van Dyne Earth 616 is familiar with. She hides her mutant status from the public, her compatriots, the government, and has taken to claiming that she's utilizing Pym particles as a lie. The mutant community or others may be able to detect her to be on, but for the purposes of any government registration requirements or social pariah elements in play, she hides her mutant self from the world. Wasp, when shrunken to smaller size, has the risk of being crushed to death by anything so large as a hard stomp with a boot-heel. In her smaller shapes, she is at risk of being severely harmed by the much larger world around her. Only Wasp's special combat suits made for her by Hank Pym change size with her. If she shrinks while wearing normal clothes, they will fall to the floor in a pile and she will be naked. Logs tagged with "wasp" or "re:wasp" will appear below automatically.